In this lesson we solve fraction divisions by thinking how many times the divisor "fits" or "goes into" the dividend. For example, the fraction 1/4 goes into five 20 times, so 5 ÷ (1/4) = 20. The lesson has lots of exercises with visual models and many word problems. The previous lesson had to do with dividing fractions by whole numbers. 1. Solve. Write a division. Then write a multiplication that checks your division. Now you write the division. Be careful: the divisor is the number that “goes into” the dividend. 2. Divide. Think, “How many times does the divisor go into the dividend?” Use the pictures to help. Did you notice a pattern? 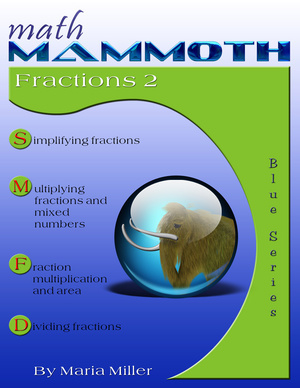 There is a shortcut to dividing a whole number by a unit fraction! into 1 exactly 4 times, it must go into 5 exactly 5 × 4 = 20 times. 3. Solve. Use the shortcut. 4. Write a division for each word problem, and solve. Do not write just the answer. a roll of string that is 6 meters long? b. How many 1/4-cup servings can you get from 2 cups of almonds? c. Ben has small weights that weigh 1/10 kg each. How many of those would he need to make 5 kg? d. An eraser is 1/8 inches thick. How many erasers can be stacked into a 4-inch tall box? 5. Write a story problem to match each division, and solve. how many times the divisor goes into the dividend. The pictures can help. 7. Write a division and solve. Write also a multiplication to check your division. b. How many times does go into ? 8. A recipe calls for 1/2 cup of butter, among other ingredients. Alison had plenty of all of the other ingredients except the butter. a. 3 cups of butter? b. 2 ½ cups of butter? 9. Jackie made three apple pies and divided them into twelfths. servings will she get out of the three pies? 10. How many 2/10-liter servings do you get from 1 liter of juice? Out of 4 liters of juice? for her in a jogging track that is 2 1/2 miles long? SS beads, which are 1/8-inch thick, and size S beads, which are 1/4-inch thick. made solely of SS beads? made solely of S beads? c. She also makes a necklace with the pattern SS-S-SS-S.
How many of each kind of bead does she need?